For those who felt like the first trailer for Sony’s upcoming urban legend-inspired thriller Slender Man looked more like the cursed video from The Ring franchise, we finally have something that gives us an idea of what the film is actually about! In addition to meeting the movie’s key players, we also get our first glimpse at the titular King of Creepypasta. Finally, something to get excited about! Slender Man is directed by Sylvain White based on the character created by Victor Surge and a script penned by David Birke; the film stars Joey King, Javier Botet, and Annalise Basso. 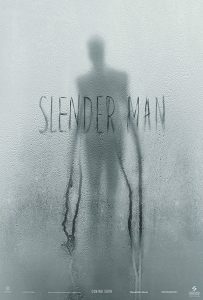 Slender Man haunts US Theaters beginning August 10th.